Mary Shelley’s Frankenstein like you have never seen it before! What began as a competition amongst friends, lovers and Romantic poets resulted in a dream that inspired one of the classic novels of English literature. Ethereal Visions Publishing features the artistry of Matt Hughes, and has created a collectible edition of the 1819 novel that is sure to become a treasured family heirloom. 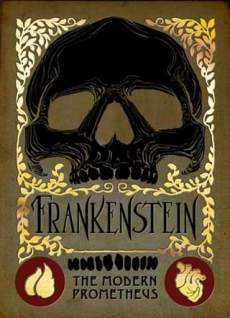 This edition of Frankenstein approaches the story of the Mary Shelley’s original concept of Frankenstein’s Monster - a self-reflection of the darker side of Victor Frankenstein and, therefore, the reader. Each chapter header is accompanied by four hand tipped-in color plates that reveal the journey of the monster from conception to birth to self-awareness and finally to the acceptance of mortality and solitude. Begin your collection of classic horror novels by participating in Ethereal Visions Publishing’s book launch campaign on Kickstarter, starting February 22. Sign up today to receive exclusive launch day rewards and pricing specials before they go public!